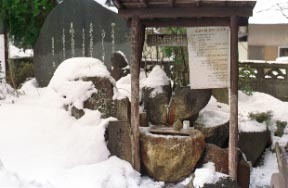 In the middle of the Muromachi period, the Okudaya ancestor who suffers from the illness discovers by Yakushi Nyorai's guidance about 500 years ago, and it is told that the Founded or started to use this hot spring was carried out from having cured the illness.The miraculous fountain of the yellow-brown color of rich efficacy feels salt with a sufficient degree by the taste which was piquant when it is a carbonate spring like an included soda pop and the carbon dioxide was drunk first.Including various components, spring quality was deep, it was drunk especially, and the effect said it to gastroenteropathy as the enough, and it is used as a spa resort for many years.It is in along the clear stream of the Ohora river, and can enjoy fishing, a swim in a river, and waterfall watching. 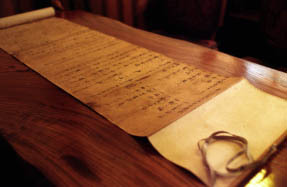 palsy -- efficacy, such as - bruise, backache, a Kikyo-Kekkyo, anemia, and hemorrhoids, is written. Or [ there is no person who became gastric cancer in transparency and colorlessness, a carbonate spring like a soda pop, and this spa ]. 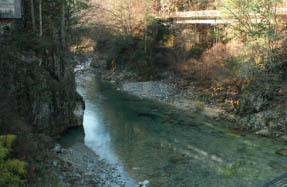 The Ohora river in front of an Okudaya. 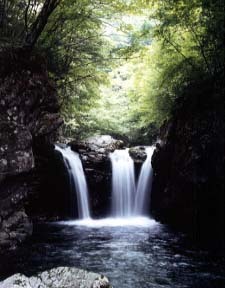 From a Gandate park, it is a takimi promenade and is 600 m.
One of the 100th elections of the waterfalls in Japan "the waterfall in Neo" is begun in Osaka-cho, and 180 waterfalls of 5-6 m or more of difference are located in it. 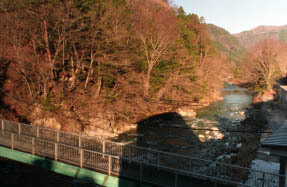 The town of waterfall watching. Event information and a schedule are important point contact. The visitor of stopping can have a mushroom dish besides rice with matsutake for free. The store of no charge and other local products comes out of a char Sake which flavored by grilled fish.